The bacon sandwich. There's a thing that's captured my imagine of late. The quest for the perfect bacon sandwich. After many hours reading, googling and testing recipes in my attempt to crack the perfect specimen, I think I might have nailed it. When I say bacon sandwich, I should clarify that I mean one based on the old school English variety, often known as a bacon sarnie, and not a fancy one with lettuce and tomato, no egg, no camembert or rocket and certainly no quinoa. I'd even happily skip the condiments. Just a humble, old fashioned bacon sandwich. Good bread, good bacon and not much else. (Brown sauce perhaps, but that is a discussion for another day). There are two elements to this beast that I shall break down and explain. Firstly the bread. I was looking for something soft and white, but not pappy. It needs to be sturdy enough to soak up the bacon's smokey juices, but not so crusty that it breaks your teeth. It needs to have a good wheaty flavour, but nothing that will overpower the bacon's smokey goodness. White factory bread wouldn't do, too flimsy, a brioche too rich, a sourdough, pide or ciabatta wasn't right either, nor was wholegrain rye or sprouted pumpkin seed bread. I think a white roll was needed, but what type? The roll required some research, which took me to Ol' Blighty, possibly the birthplace of the bacon sarnie. And I was delighted by my findings. A whole world of bread I hadn't heard of. It seems all over the UK, each region has it's own charming roll designed to wrap around a slice of bacon or two, with whimsical names like barm cakes and oven bottoms, blaas, stotties, nudgers, bannocks, butteries, and bin lids. A dazzling array of breads to try on my mission. Thankfully, it was this week's BBC Food Program that pointed me in a direction that sounded just right and saved me from a carb-ridden gluten overload. 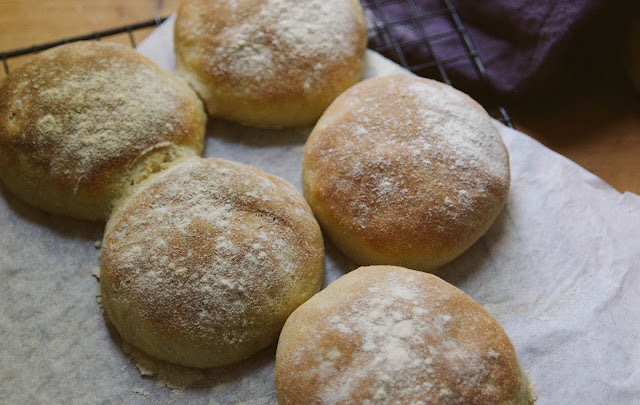 It was an incredible story on Scottish bakers, and when they mentioned two words, morning rolls, just by the name alone, which sounded so cosy and inviting, I knew I'd found what I was looking for. 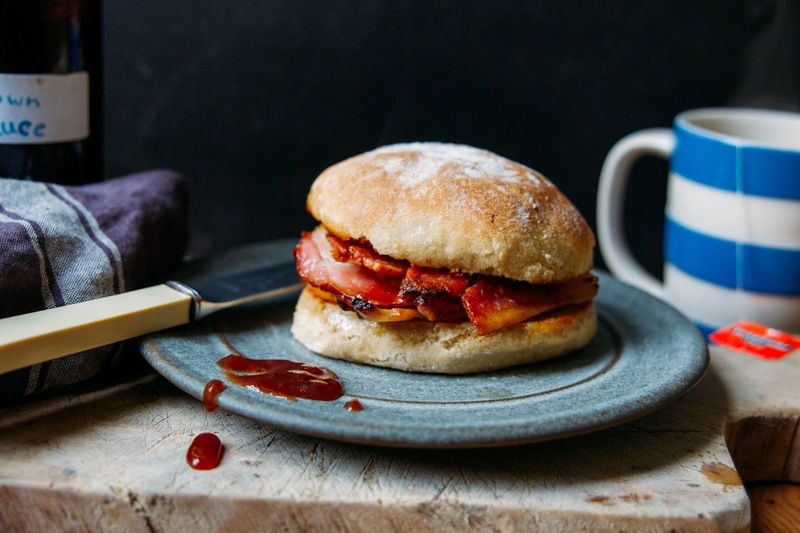 In Scotland, a morning roll is really a bap, a soft floury roll, stuffed with bacon, which I had suspected all along might be the best option. After a bit of testing I came up with a recipe, and because I use Callington Mill flour, which isn't highly processed, more like white flour with a healthy tan, these rolls have a lovely golden colour. Second critical element of course is the bacon, which must be properly smoked, generously sliced and made from well-brought up pigs. Which brings us to the end of my bacon sandwich story, I'm so glad it has a happy ending. Sieve the flour and salt then rub in the fat. Add to the bowl of a stand mixer, add remaining ingredients and knead until soft and pliable. Or make the dough by hand. Cover the dough with plastic wrap and allow to double in size in a warm place for about an hour, or in a cool place overnight. Tip the dough onto a floured surface, knock down, then divide into 8 pieces. Arrange rolls on a baking tray lined with paper, lightly press down on each roll, cover and allow to rise for another 30 minutes. Meanwhile preheat your oven to 220C. Brush the rolls with milk and dust with flour. Bake rolls in oven for about 15 minutes or til just golden. Leave for 5 minutes before transferring to a wire rack and allow to cool. To prepare the bacon, remove the rind and cut each slice into thirds. Place the bacon in a cold frying pan with a drizzle of olive oil, then gradually bring up the temperature to medium high and cook until crispy. Push the bacon to one side of the pan, then place the halved rolls, cut side down, onto the frying pan to soak up some of the delicious bacon juices. That way you don't need butter, but if you want it add by all means do. Assemble the rolls and eat as quickly as possible washed down with a good strong brew and maybe a slug of brown sauce on the side. I like my homemade version, which I might share down the track, but HP will do in a pinch. Oh what perfection! I personally have taken to eating my bacon sarnies with home made mayo, controversial I know but it's how I roll. I love your Bacon Sandwich story as much as I love you. Oh my goodness! This is my idea of heaven. Just as well our farmers' market is on this weekend. Do you think home-milled flour would be too coarse, if I sieved out the bran? A mouse got into my white baker's flour so I've been trying to make do without. Callington Mill flour is stunning – I ate some raw when we had a tour there! My luggage on our way back to Victoria after that trip was mostly flour. I think if you sifted home milled flour that would be perfect! But you may have to adjust the liquid. I love callington mill too, it really makes the loveliest flour! It's been a while since I've salivated over a blog post as much. Thank you Rory! That's a lovely thing to say. This was wonderful, Michelle. I love a good bacon butty and can think of no better story to read this morning than the story of a bacon sandwich. 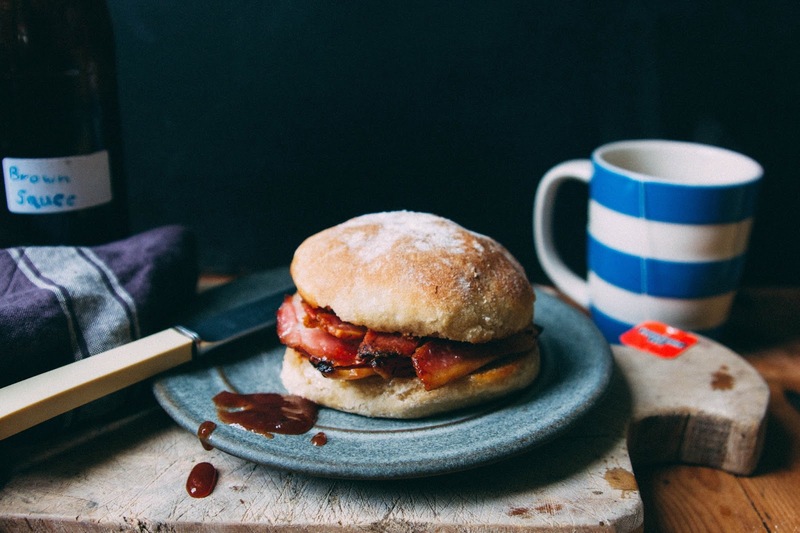 So what is in the "Brown Sauce" and how do you make it? Bacon sarnies are the BOMB. And there's no need to discuss the brown sauce. But I will take the extra butter on my roll. I'm half way through reading your book, it's delightful. Hello Dani - I use Lowan yeast, always works for me.